Attaches to the 9102 "Dual Slab" heater core used on various Chrysler products from the mid 60's. Fits various Chrysler products with factory A/C from the mid 60's including Charger, Coronet, Satellite, Road Runner, GTX, R/T, etc.. Has three heater necks and requires use of heater control valve. Valve is available separately. This heater core fits 1949 to 1952 Chevrolet passenger cars with the "Outside" or "Airflow" style heater assembly. It is recored and comes with a 1 Year Guarantee. A $75 core charge may be required. Please call us for details. This heater core fits 1955 and 1956 Chevrolet passenger cars. It is the DeLuxe or Airflow style heater. It is recored and comes with a 1 Year Guarantee. This heater core fits 1955 and 1956 Chevrolet passenger cars. It is the DeLuxe or Airflow style heater. It is 100% new and comes with a 1 Year Guarantee. The core is 2 1/2" thick.It is made just like the OEM. This heater core fits 1957 Chevrolet passenger cars. It is the DeLuxe or Airflow style heater. It is 100% new and comes with a 1 Year Guarantee. The core is 10" wide and 2 1/2" thick. This heater core replaces the round heater cores that GM put under the front seat in various models from the early 40's into the 50's. This heater core fits 1949 to 1951 Ford passenger cars with the Fresh Air style heater assembly. Also called "Magicaire". It is recored and comes with a 1 Year Guarantee. This heater core fits 1952 to 1956 Ford passenger cars with fresh air style heater. It is recored and comes with a 1 Year Guarantee. The original Ford part number was FAA 18476-A. A core charge of $75 may be required. Please call us for details. 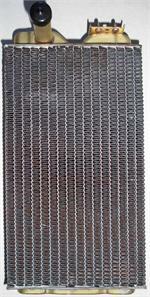 This heater core fits 1957 and 58 Ford passenger cars with the fresh air type heater. It is recored and comes with a 1 Year Guarantee. It requires a heater control valve to be mounted to it. (Not included). A $75 core charge may be required. Please call. This heater core fits 1959 Ford and Edsel passenger cars. It is recored and comes with a 1 Year Guarantee. It fits cars with the Fresh Air Style heater assembly. A $75 core charge may be required. Please call us for details. This heater core fits 1960 and 1961 Ford and Edsel passenger cars. It is recored and comes with a 1 Year Guarantee. The core is 2 1/2" thick. Please confirm thickness of your core before ordering. A $75 core charge may be required. Please call. Jaguar round replacement heater core. Constructed of durable 10mm wire wound tubing. 7 3/4" outside diameter, 4 3/8" inside diameter, 2.25" thick, 1/2" diameter necks are 2.75" long. Provides great heat transfer and is very long lasting. Jaguar round replacement heater core. Constructed of durable 10mm wire wound tubing. 7 3/4" outside diameter, 4 3/8" inside diameter, 2.75" thick, 1/2" diameter necks. Provides great heat transfer and is very long lasting. Triumph round replacement heater core. 7 3/4" outside diameter, 4 3/8" inside diameter, 4" thick 1/2" diameter necks Fits various Triumph models. Constructed of long lasting and efficient wire wound tubing. 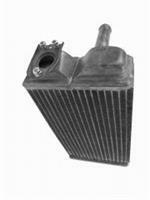 This heater core fits 1959 to 62 Cadillac, 59/60 Chevy Airflow design and other GM passenger cars. Has flange for heater valve attachment and a 3/4" diameter neck. It is a complete new heater core and comes with a 1 Year Guarantee. This heater core fits 1957 Chevrolet passenger cars. It is the DeLuxe or Airflow style heater. It is recored and comes with a 1 Year Guarantee. The core is 10" wide and 2 1/2" thick. This heater core fits 1958 Chevrolet passenger cars with the "Airflow" style heater assembly. It is recored and comes with a 1 Year Guarantee. A $75 core charge may be required. Please call us for details. This heater core fits 1959 to 62 Cadillac, 59/60 Chevy Airflow design and other GM passenger cars. It is recored and comes with a 1 Year Guarantee. A $75 core charge may be required. Please call us for details. Fits 46-48 Chevy Trucks With Outside Air Heater and Defroster. Also fits 50-52 Chevy Trucks With Airflow Style Heater and Defroster. A $75 core charge may be required. Please call us for details. This heater assembly has been dis-assembled, the heater was flushed and pressure tested, has no leaks, 6 Volt blower motor was tested, the case was glass beaded and primed with Rustoleum primer and it was re-assembled. 90 day Guarantee.